Div Bhansali is director of self-service products for Platform-A, and serves as product manager for Platform-A’s self-service display advertising solutions, BidPlace SB and LeadBack.com. Div came to Platform-A by way of AOL / Advertising.com, where he served as Product Development Director. AdExchanger.com: What is Platform-A's BidPlace SB and tell us about BidPlace's product pipeline? DB: BidPlace SB is Platform-A’s new banner advertising solution for small- to mid-sized advertisers. Platform-A is known for offering large advertisers fully managed advertising campaigns across the largest banner ad network on the Web. BidPlace SB is the first Platform-A product specifically geared towards giving smaller advertisers access to that same high-reach network. BidPlace SB is all about targeting, performance and control. Our targeting options are the broadest and most diverse of any self-service product, and combined with our unparalleled reach, they give advertisers the chance to achieve both accuracy and volume in lead generation. We’re an excellent performance option because advertisers can pay per click and set their own prices. And we offer control via on-demand reporting at the account, campaign and banner level. We encourage our advertisers to test different targeting combinations and banners to find what works best for their needs. BidPlace SB is the first product in what will become a BidPlace suite of products. This summer, Platform-A will be rolling out BidPlace Professional, which will give larger advertisers a chance to combine self-service campaign management with full account support. Is BidPlace SB an advertising exchange? If not, will there be an ad exchange appearing in the near future from Platform-A? In my mind, BidPlace SB isn’t an advertising exchange (yet), because the advertiser can’t select the specific site(s) where they want to advertise. Right now, we’re a true advertising network, which means users are trading the transparency they would expect from an exchange for our superior value and reach. At some point in the future, I expect BidPlace SB to offer both – a network for advertisers who want to target a specific audience, and an exchange for those who want to target specific sites or placements. It looks like BidPlace SB is for advertisers only. How can publishers participate? Larger publishers can learn more about monetizing their inventory within our network by visiting Platform-A's Publisher Solutions section (http://www.platform-a.com/publisher-solutions). Platform-A also has a self-service solution for smaller publishers, called PubAccess (www.pubaccess.com), which allows niche publishers to earn CPM or revenue-share payouts on their inventory. And of course, I encourage publishers of all sizes to try BidPlace SB and LeadBack.com to build their unique visitor base and bring them back to their sites. What does BidPlace SB do to ensure brand safety? Well, the best way to ensure brand safety is to start with a network that has the highest-quality publisher sites. Platform-A conducts a rigorous screening process for all of our publishers, thoroughly checking applicants for inappropriate site content and/or behavior (auto-downloading applications, for instance). The same applies on the advertiser side. Our Network Quality team checks every BidPlace SB advertiser, as well as their specific ad campaigns, to make sure they meet our content and creative guidelines. Where does BidPlace SB get its inventory? Would you characterize it as remnant? BidPlace SB relies on Platform-A’s Advertising.com network for our inventory. As far as whether it’s “remnant”, like any ad network, we buy inventory that varies greatly in its content and style. Some of it monetizes a lot better than others, but obviously we wouldn’t be achieving 91% reach across the Web without including a lot of very high-value inventory. What is LeadBack? Does it work with BidPlace? LeadBack is Platform-A’s self-service retargeting product. Advertisers can sign up at LeadBack.com to show ads to people who have already visited their site. When the visitor leaves the site and goes to other sites in our Advertising.com network, LeadBack.com shows them that advertiser’s banner ads to bring them back to the original site. The theory behind LeadBack.com is that the best leads any online marketer has are the ones who have already visited her site. We know they’re interested, and LeadBack.com turns that interest into conversions. And best of all, LeadBack.com only charges for clicks back to the advertiser’s site, not for impressions. Right now, LeadBack.com and BidPlace SB are two separate products. In the future, we may look to integrate them to some extent, to simplify campaigns and reporting for our clients who use both products. Is there minimum pricing and budgets for LeadBack and BidPlace SB? BidPlace SB has a minimum daily budget of $10, and pricing starts as low as $1 CPM or $0.25 CPC. The more targeted the campaign, the higher the minimum price. And clients have full visibility into our pricing for all targeting options, so they can find the balance of targeting and value that’s best for them. LeadBack.com currently works on a campaign budget minimum of $200, but an advertiser can run through that budget as quickly or as slowly as their clicks allow. The larger their site population (i.e. the number of people who have already visited their site), the more clicks they should get via LeadBack.com. Any plans for APIs from Platform-A with or without BidPlace SB? That’s a great question. We’ve had significant demand for API’s for BidPlace SB from agencies and SMB partners, and we hope to be able to offer external API’s within the next few months. Are there any upcoming shows or events at which people can learn more about BidPlace SB or LeadBack? Yes, Platform-A will have a booth presence at ad:tech in San Francisco on April 21-23, and we’ll have BidPlace SB and LeadBack.com materials available there. We’ll also be at Affiliate Summit East in New York in August, along with our sister company, buy.at, which is a leading affiliate marketing network. Who do you see as key competitors to BidPlace and LeadBack? In the banner advertising space, BidPlace SB competes against Yahoo! and Ad Brite, among others. LeadBack.com competes against retargeting.com and Fetchback. Where online can one learn more about BidPlace and LeadBack? 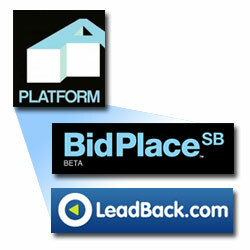 You can check out bidplacesb.com and leadback.com to learn more about the products. Also check us out on twitter (bidplacesb and leadback) for product updates and news. What do you see as the advertising exchange's role in the future? I expect advertising networks and exchanges to have a very bright future. From a publisher standpoint, any site that isn’t monetizing at 100% sell-through can benefit from a network or exchange, especially partners with a reputation for working to protect publishers’ brands. Meanwhile, advertisers are gaining one-stop access to site placements that they may not have been able to negotiate independently. Advertisers have a great deal of leverage in the current marketplace, and can use that strength to achieve exceptional value via exchanges and networks. I see this as a win-win for the industry. In your opinion, how do exchanges move from a remnant inventory model to a premium and remnant model? The key is to better address what each side of the exchange equation wants. Advertisers are looking for transparency – not just at the publisher level, but by site, URL, and even placement. The more visibility they receive from an exchange, the more confident they feel about investing in a consistent spend with them. The goal here is to attract advertisers of every type, large and small – like Google has done with AdWords. If exchanges become willing to relinquish the sense of influence over the inventory buying and selling process that they currently have, and cede that transparency and control to their clients, I think premium inventory can absolutely fall within their grasp. Follow BidPlace SB (@bidplacesb), Leadback (@leadback) and AdExchanger.com (@adexchanger) on Twitter.